For the first time in the country's history, paleontologists in Mexico have discovered a fully articulated dinosaur tail – and it's a doozy. Believed to have belonged to a hadrosaur living 72-million years ago, the tail's 50 intact vertebrae extend a whopping 16-feet in length, and are in pristine condition. 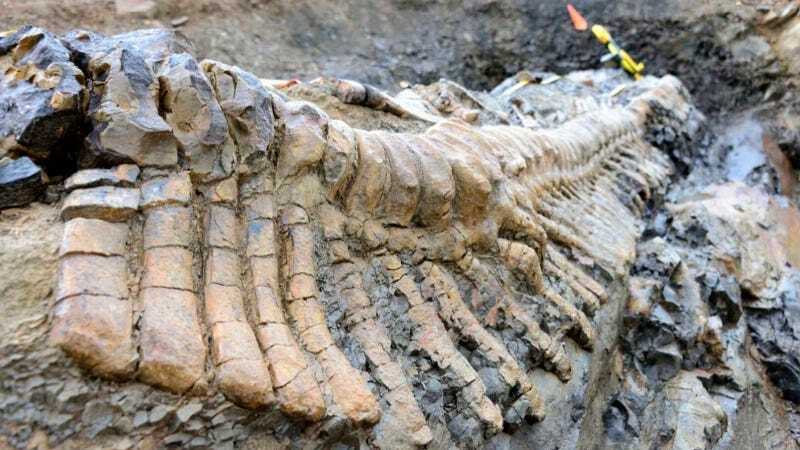 That a fully articulated tail has never before been discovered in Mexico – a country with a rich paleontological history – should give you some idea of how rare a find this is. That it looks this good after more than 70-million years is just icing on the cake. The tail was recovered near the town of General Cepeda in the state of Coahuila following 20 days of excavation by paleontologists from the National Institute of Anthropology and History (INAH) and the National Autonomous University of Mexico (UNAM). Buried in the tail's immediate vicinity was a variety of other fossilized bones, including a hip. Judging from the length of the tail, paleontologist Felisa Aguilar, who directed the excavation, predicts its duck-billed, crest-headed owner may have measured almost 40-feet long. Aguilar believes the remainder of the specimen may be entombed still deeper in the earth, beneath where the tail was found. Even without the rest of the skeleton, however, the find remains a significant one. "For the biological study of dinosaurs this finding is important because we will have a sequence that will reveal the characteristics of the vertebrae," and how they vary in size depending on their position along the spine.